Like their human counterparts, farming insects use behavioral and chemical strategies to promote the growth of their agricultural crops over weeds, which in their case are fungi instead of plants. For example, fungus-farming attine ants and termites use antibiotics to defend their food fungi. Our study demonstrates ambrosia beetles use ethanol, a potent antimicrobial agent, to promote the growth of their food fungi over “weedy” moulds. Ambrosia beetles are among the true fungus farming insects, whereby they propagate, cultivate, and sustainably harvest monocultures of fungal crops within tissues of trees (Figs. 1−3). Adult females – so called foundresses – bore within the sapwood, where they create tunnel systems to farm the crops and rear offspring. Many species of ambrosia beetles attack a broad range of trees for growing their fungal gardens and rearing offspring, but weak trees emitting stress-induced ethanol are preferentially attacked while healthy trees are avoided. 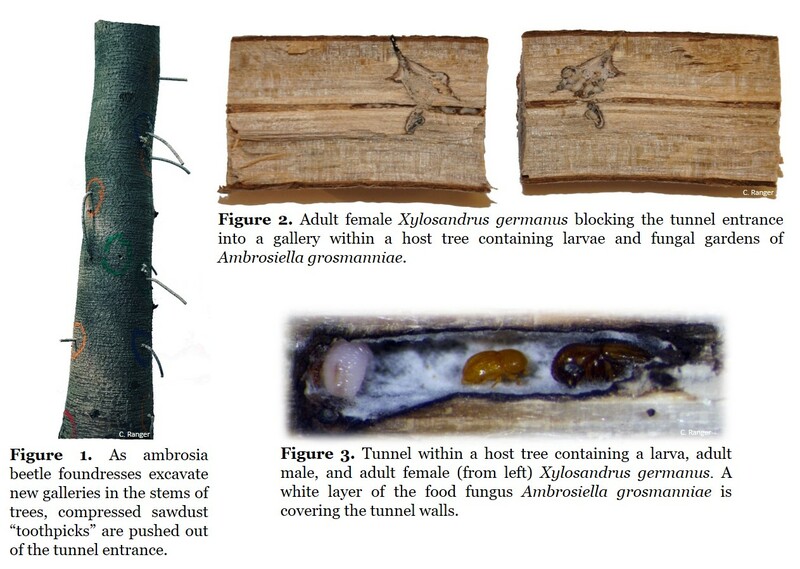 Since it is crucial for ambrosia beetles to rapidly establish their fungal gardens within newly excavated tunnels, we felt it was counterintuitive for the foundresses to exhibit a strong preference for tissues containing ethanol. The antimicrobial properties of ethanol have been exploited by humans since prehistory, and it is long used as a preservative to protect food from pathogens. Why choose a hostile environment for fungus farming, especially since foundresses delay laying eggs until the gardens are established? As part of a series of experiments, Pete Schultz, Mike Reding, and I decided to first allow ambrosia beetles to freely choose among trees baited with ethanol lures but absent of in vivo ethanol vs. trees irrigated with dilute solutions of ethanol that resulted in ethanol being translocated into stem tissues. Ambrosia beetles readily attacked the ethanol-baited and ethanol-irrigated trees, but fungal gardens and eggs only occurred in stems of the ethanol-irrigated trees (Fig. 4). No fungal gardens and therefore no ambrosia beetle eggs were observed in stems of the ethanol-baited trees. These results were the first indication that ethanol might benefit ambrosia beetle fungal symbionts. 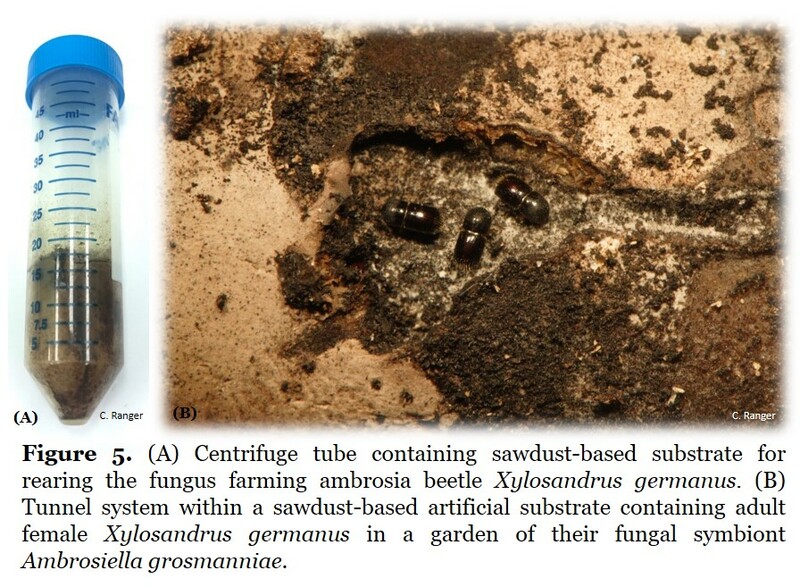 Peter Biedermann and I then collaborated on an experiment to incorporate ethanol into a sawdust-based substrate used for rearing Xylosandrus germanus ambrosia beetles (Fig. 5). Upon dissecting the media, we found the incidence of fungus gardens, larvae, and pupae increased up to 2% of ethanol and then decreased in response to higher amounts. Given their expertise with microbiology, Vipaporn Phuntumart and her students Gayathri Beligala and Satyaki Ghosh designed an agar-plate bioassay to assess the growth of Ambrosiella grosmanniae, the food fungus of X. germanus, in the presence of ethanol. In one of those exhilarating moments that drives scientists’ pursuit of knowledge, we observed the fungal crop A. grosmanniae displayed improved growth in the presence of ethanol (Fig. 6). Vipaporn Phuntumart, Peter Biedermann, and Robert Mueller subsequently demonstrated that the growth of other fungal symbionts exhibited increased growth up to 2% of ethanol and then decreased in growth with higher amounts. By contrast, the growth of fungal garden weeds (Penicillium sp. and Aspergillus sp. ), that we isolated from beetle gardens decreased with increasing amounts of ethanol. Finally, J. Philipp Benz determined the detoxifying activity of alcohol dehydrogenase is higher in the food fungi than in the fungal weeds. Ambrosia beetle fungal symbionts presumably use ethanol as a carbon source, but additional studies are warranted. Prior to this study, ambrosia beetles were thought to have a strong affinity for ethanol because the stress-induced volatile compound acted as a bioindicator of weakened trees. 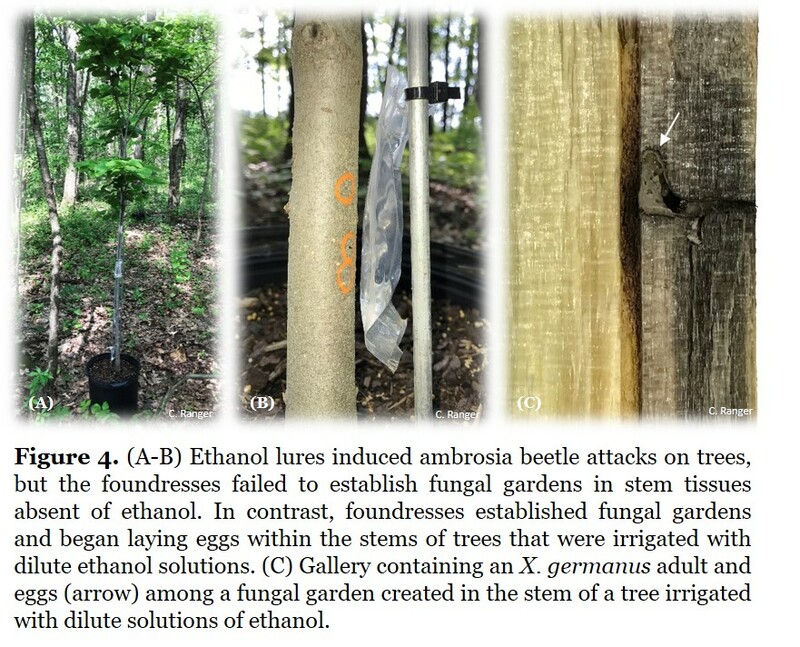 Our study expands upon this scenario by demonstrating that ambrosia beetles preferentially select host tree tissues containing ethanol because it promotes the growth of their nutritional fungal crops and reduces competition with antagonistic microbes. 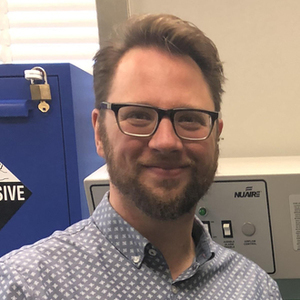 Screening for fungal symbionts capable of withstanding the presence of ethanol represents a mechanism to achieve a successful partner. Ambrosia beetles using ethanol to benefit their fungiculture is comparable to horticultural practices used by other insect and human farmers, including picking soils for optimal growth of cultivars, crop fertilization and chemical control of competitors and pathogens. Still, additional chemical tactics used during ambrosia beetle fungiculture remain to be elucidated. Do the fungal symbionts produce antimicrobial compounds that suppress the growth of garden competitors? For instance, ambrosia beetle fungal symbionts are known to produce ethanol. In doing so they might help to create up a toxic environment, in which the fungal symbionts can outcompete weeds. Similarly, what is the chemical ecology of other microbes associated with ambrosia beetles and their fungal gardens?